Welcome to Purposed Physical Therapy’s resource on Adhesive Capsulitis. Many adults (mostly women) between the ages of 40 and 60 years of age develop shoulder pain and stiffness called adhesive capsulitis. You may be more familiar with the term frozen shoulder to describe this condition. Frozen shoulder and adhesive capsulitis are actually two separate conditions. The shoulder is made up of three bones: the scapula (shoulder blade), the humerus (upper arm bone), and the clavicle (collarbone). The joint capsule is a watertight sac that encloses the joint and the fluids that bathe and lubricate it. The walls of the joint capsule are made up of ligaments. Ligaments are soft connective tissues that attach bones to bones. 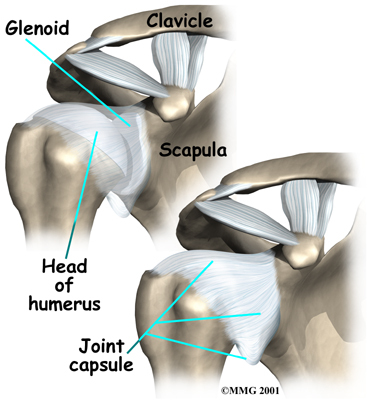 The joint capsule has a considerable amount of slack (loose tissue), so the shoulder is unrestricted as it moves through its large range of motion. The terms frozen shoulder and adhesive capsulitis are often used interchangeably. In other words, the two terms describe the same painful, stiff condition of the shoulder no matter what causes it. A more accurate way to look at this is to refer to true adhesive capsulitis (affecting the joint capsule) as a primary adhesive capsulitis. As the name suggests, adhesive capsulitis affects the fibrous ligaments that surround the shoulder forming the capsule. The condition referred to as a frozen shoulder usually doesn't involve the capsule. Secondary adhesive capsulitis (or true frozen shoulder) might have some joint capsule changes but the shoulder stiffness is really coming from something other than the joint capsule. Some of the conditions associated with secondary adhesive capsulitis include rotator cuff tears, biceps tendinitis, and arthritis. In either condition, the normally loose parts of the joint capsule stick together. This seriously limits the shoulder's ability to move, and causes the shoulder to relatively freeze. The cause or causes of either primary adhesive capsulitis or secondary adhesive capsulitis (frozen shoulder) remain largely a mystery. Some of the risk factors for adhesive capsulitis include diabetes, thyroid dysfunction, and autoimmune diseases. Anyone who has had a heart attack, stroke, or been treated for breast cancer is also at an increased risk for this condition. A significant number of people, however, develop adhesive capsulitis without any known trauma, medical history, or other risk factor. In the case of secondary adhesive capsulitis (true frozen shoulder), the problem is really coming from something outside the joint. Some of the conditions associated with secondary adhesive capsulitis include rotator cuff tears, impingement, bursitis, biceps tendinitis, and arthritis. For either type, an overactive immune response or an autoimmune reaction may be at fault. In an autoimmune reaction, the body's defense system, which normally protects it from infection, mistakenly begins to attack the tissues of the body. This causes an intense inflammatory reaction in the tissue that is under attack. No one knows why this freezing reaction occurs so suddenly. Pain and stiffness may begin after a shoulder injury, fracture, or surgery. It can also start if the shoulder is not being used normally. This can happen after a wrist fracture, when the arm is kept in a sling for several weeks. For some reason, immobilizing a joint after an injury seems to trigger the autoimmune response in some people. Doctors theorize that the underlying condition may cause chronic inflammation and pain that make you use that shoulder less. This sets up a situation that can create adhesive capsulitis. With a primary adhesive capsulitis, treatment of any associated risk factors or underlying medical conditions may be needed before working to correct the tissues around the shoulder. In the case of secondary adhesive capsulitis, it may be necessary to treat the shoulder first in order to regain its ability to move before the underlying musculoskeletal problem can be addressed. What are the symptoms of adhesive capsulitis? The symptoms of adhesive capsulitis (and frozen shoulder) are primarily shoulder pain and stiffness, resulting in a very reduced range of shoulder motion. The tightness in the shoulder can make it difficult to do regular activities like getting dressed, combing your hair, or reaching across a table. The diagnosis of adhesive capsulitis is usually made on the basis of your medical history and physical examination. One key finding that helps differentiate adhesive capsulitis from a frozen shoulder is how the shoulder moves. With adhesive capsulitis, the shoulder motion is the same whether the patient or the doctor tries to move the arm. With a frozen shoulder, say from a tendinitis or rotator cuff tear, the patient cannot move the arm normally or through the full range of motion but when someone else lifts the arm it can be moved in a nearly normal range of motion. Simple X-rays are usually not helpful. 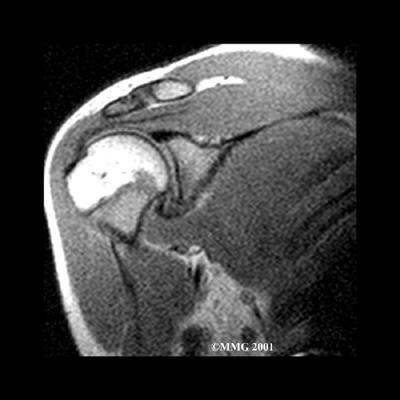 An arthrogram may show that the shoulder capsule is scarred and tightened. The arthrogram involves injecting dye into the shoulder joint and taking several X-rays. In adhesive capsulitis, very little dye can be injected into the shoulder joint because the joint capsule is stuck together, making it smaller than normal. The X-rays taken after injecting the dye will show very little dye in the joint. As your ability to move your shoulder increases, your doctor may suggest additional tests to differentiate between primary adhesive capsulitis and secondary adhesive capsulitis (from an underlying condition, such as impingement or a rotator cuff tear). Probably the most common test used is magnetic resonance imaging (MRI). An MRI scan is a special imaging test that uses magnetic waves to create pictures that show the tissues of the shoulder in slices. The MRI scan shows tendons and other soft tissues as well as the bones. The final and most accurate diagnosis is made when an arthroscopic exam is done. The arthroscopic exam makes it possible to identify exactly which stage of disease you may be in. Tissue samples taken from inside and around the joint are examined under a microscope. Four separate stages of primary adhesive capsulitis have been recognized from arthroscopic tissue sampling. Symptoms present at any given time usually correspond to the stage you are in. In the first stage, pain prevents full active shoulder motion (active motion means you move your own shoulder) but full passive motion (an examiner moves your shoulder without help from you) is still available. There are some inflammatory changes in the synovium (lining around the joint) but the capsular tissue is still normal. In stage two (the freezing stage), pain is now accompanied by stiffness and you start to lose full passive shoulder motion. External rotation is affected first. The rotator cuff remains strong. These two symptoms differ from secondary adhesive capsulitis (what might otherwise be called a frozen shoulder). The condition referred to as a frozen shoulder is more often characterized by damage to the rotator cuff and loss of internal rotation first. The pain during stage two of primary adhesive capsulitis is worse at night. Cellular changes continue to progress with increased blood flow to the synovium. There are early signs of scarring of the capsule from the inflammatory and repair processes. By stage three of primary adhesive capsulitis (the frozen stage), there is less pain (mostly at the end range of motion) but more stiffness. There is a true loss of active and passive shoulder joint motion. Very little, if any, inflammation is seen in the tissue samples viewed under a microscope. Instead, the pathologist sees much more fibrotic (scar) tissue. In the final (chronic) stage (stage four) you don’t have pain but instead there is profound stiffness and significant loss of motion. Both of these symptoms will gradually start to get better. The body is no longer attempting to repair or correct the problem. Enough scar tissue is present to make it difficult for the surgeon to see the joint during arthroscopic examination. Treatment is based on any underlying causes (if known), any risk factors present, and the stage at the time of diagnosis. There isn't a one-best-treatment known for adhesive capsulitis. Studies done so far just haven't been able to come to a single evidence-based set of treatment guidelines for this problem. 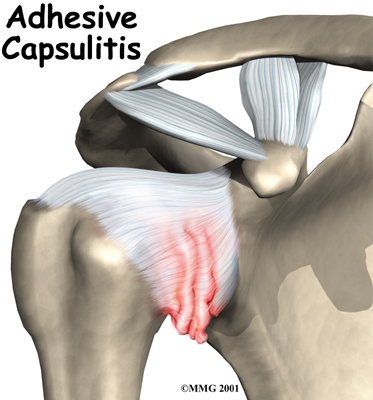 Treatment of adhesive capsulitis can be frustrating and slow. Most cases eventually improve, but the process may take many months. The goal of your initial treatment is to decrease inflammation and increase the range of motion of the shoulder. Your doctor will probably recommend anti-inflammatory medications, such as aspirin and ibuprofen. During the early stage, your doctor may also recommend an injection of cortisone together with a long-acting anesthetic, similar to lidocaine, to get the inflammation under control. Cortisone is a steroid that is very effective at reducing inflammation. Controlling the inflammation relieves some pain and allows the stretching program to be more effective. Physical Therapy treatments at Purposed Physical Therapy are a critical part of recovery and rehab from this injury. The first goal is to reduce pain and interrupt the inflammatory cycle. Next our treatments are directed at getting the muscles to relax in order to help you regain the motion and function of your shoulder. The overall goal of Physical Therapy is to help you regain full range of motion in the shoulder. If your pain is too strong at first to begin working on shoulder movement, your Physical Therapist may need to start with treatments that focus on pain control. The use of ice, heat, ultrasound, and other electrical modalities may be useful at this stage. Your therapist may also use massage and gentle mobilizations to ease muscle spasm and pain. If your doctor has prescribed it, iontophoresis may also be used. Iontophoresis is a way to push medications through the skin directly into the inflamed tissue by using an electrical modality to apply the medication. As soon as possible your therapist will begin to work on regaining your shoulder’s movement, even if that range of movement is only small at first. Your sessions may begin with treatments such as moist hot packs, ultrasound or massage, which help to relax the muscles and get the shoulder tissues ready to be stretched. Your Physical Therapist will assist you in stretching your shoulder through the available ranges of motion, but they will also show you stretches that you can do on your own as part of a home program. Using an overhead shoulder pulley in the clinic and as part of a home program is extremely useful in gaining shoulder range of motion. Doing pendular exercises can also assist with pain at this stage, and help to maintain some shoulder range of motion. Pendular exercises are performed by leaning forward or to the side, letting the arm hang clear of the chest, and then initiating movement with your trunk so that the dangling limb passively and gently moves. This action provides some traction to the glenohumeral joint (shoulder joint), which aids in pain relief, and also assists the shoulder into a relative elevated motion (in relation to the trunk.) It is important that the pendular activity is done as passively as possible without initiating motion from the shoulder muscles. The exercise should look similar to a weighted pendulum that randomly swings on the end of a piece of string. If your doctor recommends an injection of a long-acting anesthetic with cortisone for your shoulder, you should plan on seeing your Physical Therapist at Purposed Physical Therapy right after the injection. The extra fluid from the injection stretches out the tissues of the joint capsule so an aggressive session of stretching right after an injection can help maximize the stretch to the joint capsule. Your Physical Therapist can liaise with your doctor regarding a planned injection in conjunction with a stretching session. Maintaining your neck range of motion is also very important when your shoulder is not moving well, so your therapist will also prescribe exercises to ensure you can move your neck well for all your daily activities, and that you don’t end up with a stiff neck along with your stiff shoulder. The next part of your treatment at Purposed Physical Therapy will involve mobilizing the joints of your shoulder, including your glenohumeral joint, the joint of the shoulder blade and the thorax (scapulothoracic joint), and even the joints where your collarbone joins the trunk and the shoulder (sternoclavicular and acromioclavicular joints.) Your Physical Therapist will passively move these joints into their available ranges of motion while you relax the muscles of your shoulder completely. Interestingly, the strength of your shoulder is often maintained in primary adhesive capsulitis, especially once you pass the stage of having pain and are simply restricted because of the range of motion. As you gain more range of motion, however, you will notice weakness in the shoulder in these ranges of movement simply because you have not used the shoulder in these ranges for an extended period of time. For this reason, your therapist will focus more on strengthening exercises in the later stages of your rehabilitation, once your pain is under control and your shoulder range of movement is improving. With secondary adhesive capsulitis there may be significant weakness in the shoulder due to the original injury that started the process in the first place (ie. shoulder impingement or rotator cuff tear.) In these cases, your therapist will start by prescribing simple strengthening exercises. Initially this will only involve isometric strengthening. Isometric strengthening exercises are done by tightening your muscles without actually moving the associated joint. Isometric exercises work the muscles without straining the injured or painful tissues. Your Physical Therapist will teach you how to use your other hand or a wall for resistance while you flex and tighten your muscles, creating an isometric contraction of the shoulder muscles. Your therapist will then progress your exercises so that you are strengthening the muscles through their available ranges of motion as you regain these motions. This may involve using light-weights or Theraband to add resistance for your upper limb. Adequate strength and endurance in the rotator cuff muscles throughout a variety of ranges of motion, including over shoulder height, is needed to ensure full functioning of the shoulder. As a result of any injury, the receptors in your joints and ligaments that assist with proprioception (joint sense of position) decline in function. A period of immobility will add to this decline. Although your arm and shoulder girdle are not traditionally thought of as weight-bearing parts of the body, even an activity such as assisting yourself with your arms to get out of a chair or pulling a glass from a cupboard requires weight to be put through or lifted by your shoulder girdle and for your body to be proprioceptively aware of your limb. The proprioceptive control of the scapula on the rib cage (scapulothoracic motion) is especially important in being able to use your shoulder girdle and upper limb effectively without causing further injury. Normal scapulothoracic motion is particularly essential once you are able to use your limb near or above shoulder height. For this reason, your Physical Therapist will teach you how to properly control your scapula during everyday activities as well as during your rehabilitation exercises. Your Physical Therapist will also remind you about maintaining good shoulder posture even when sitting or using your upper limb in activities below shoulder height, such as working on the computer. Rounded shoulders in this position crowds the shoulder joint and can lead to or prolong shoulder impingement and pain. Regaining proprioception of the shoulder girdle and upper limb requires concentrated work, as most people have not previously needed to focus so intently on such controlled motions. The concentrated effort, however, has a substantial reward, as good scapulothoracic control is the key to avoiding further shoulder problems once your adhesive capsulitis has been rehabilitated. Proprioceptive exercises might include activities such as rolling a ball on a surface with your hand, holding a weight up overhead in lying while you move your shoulder, or pushups on an unstable surface. Advanced exercises may include activities such as ball throwing or catching overhead once you gain that range of motion. As mentioned above, adhesive capsulitis can unfortunately be a slow problem to resolve. You may need therapy treatments for three to four months or longer before you get full shoulder motion and function back, and you will need to also continue your home exercise program for at least as long. If conservative treatment at Purposed Physical Therapy is not progressing as quickly as your Physical Therapist would expect, then more aggressive intervention may be required. If progress in rehabilitation is slow, your doctor may recommend manipulation under anesthesia (MUA.) This means that you are put to sleep with general anesthesia. Once under the anesthesia the surgeon then aggressively stretches your shoulder joint into the ranges of motion that you were unable to achieve on your own. The heavy action of the manipulation stretches the shoulder joint capsule and breaks up the scar tissue. In most cases, the manipulation improves motion in the joint faster than allowing nature to take its course on its own. You may need this procedure done more than once. As with any procedure, MUA has risks. 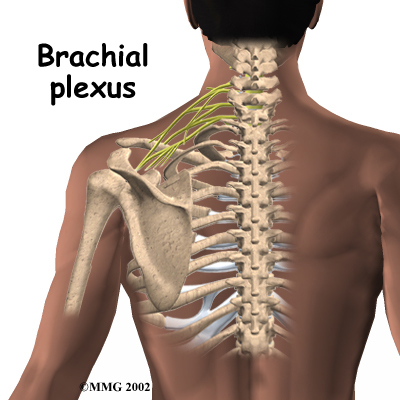 There is a very slight chance that the aggressive stretching can injure the nerves of the brachial plexus, which is the network of nerves running to your arm. There is also a risk of fracturing the humerus (the bone of the upper arm), especially in people who have osteopenia or osteoporosis (fragile bones). When it becomes clear that Physical Therapy and MUA have not improved shoulder motion, an arthroscopic release may be needed. This procedure is usually done using an anesthesia block to deaden the arm. The surgeon then uses an arthroscope, which is a slender tube with a camera attached, to see inside the joint. During the arthroscopic procedure, the surgeon cuts (releases) any restricting scar tissue, the ligament on top of the shoulder (coracohumeral ligament), and a small portion of the joint capsule. A biopsy of the scar tissue is also sent to the lab for evaluation to determine the stage of adhesive capsulitis. If shoulder movement is not regained or if the surgeon is unable to complete the surgery using the arthroscope, an open procedure may be needed. An open procedure requires a larger incision so the surgeon can work inside the joint more easily. At the end of the release procedure, the surgeon gently manipulates the shoulder to gain additional motion. A steroid may also be injected into the shoulder joint at the completion of the procedure. Numbing the suprascapular nerve to the shoulder is a newer technique used in some pain clinics. This procedure can be done on an outpatient basis, which means you’ll be in and out the same day. A single injection of a numbing agent combined with a steroid medication temporarily eliminates the pain signals, similar to hitting a “reset” button inside the shoulder. The nerve pathway sending continuous pain signals from the shoulder to the spinal cord and up to the brain is turned off. For a short time, the patient can move the arm fully without pain, and often that is enough to get the shoulder back on track for improved movement and function. Another new technique called hyrdodilation or brisement is being used as an alternative to surgery. 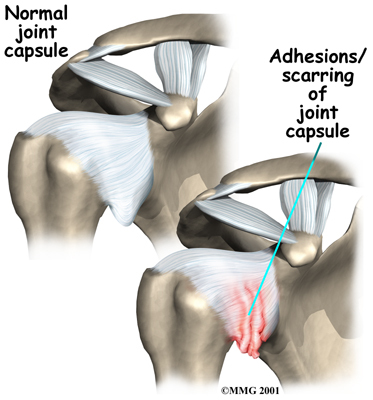 A fluid is injected into the joint causing the capsule to expand until the adhesions and scar tissue burst. The result can be relief of pain and improved function. Unfortunately there have not been enough studies done yet to see how well this approach really works or to determine any long-term effects of this technique. In addition, there have not been any studies comparing this technique to other more traditional techniques, such as manipulation or nerve block, to determine if it is really any more effective. What can I expect during rehabilitation after one of the above treatments? Immediately after one of the above procedures, your surgeon may place your shoulder in a continuous passive motion (CPM) machine. CPM machines are used immediately after many different types of joint surgeries. This machine keeps the shoulder moving and alleviates joint stiffness. The machine simply straps to the arm and, as the name suggests, continuously moves the joint. This continuous motion is thought to reduce stiffness, ease pain, and keep extra scar tissue from forming inside the joint. Some surgeons apply a dynamic splint to the shoulder after manipulation or arthroscopic surgery. A dynamic splint puts the shoulder into a full stretch and holds it in that position. 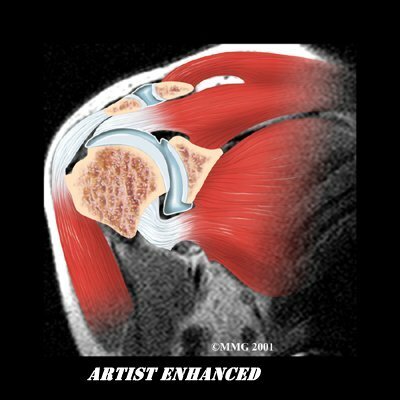 Keeping the shoulder stretched gradually loosens up the joint capsule. You'll resume Physical Therapy at Purposed Physical Therapy within one to two days after undergoing any of the non-conservative treatment approaches. Some surgeons have their patients in therapy every day for one to two weeks. The idea of Physical Therapy so soon after the treatment is to maintain the range of motion that was gained during the procedure, so aggressive and repetitive stretching will be necessary. The stretching also keeps new scar tissue from forming and binding the capsule again. Your Physical Therapist will also encourage you to frequently do your home exercise program, which, at this stage, will mainly consist of range of motion and some proprioception exercises. A pulley will be very useful at this time to repetitively move your shoulder passively into its new range of motion. Your Physical Therapist will also encourage you to use your shoulder and arm as frequently as possible in everyday activities to also encourage range of motion. Modalities such as heat, ice, ultrasound, or electrical current may be used after the stretching to aid in pain relief. Your shoulder movement should improve continually after the procedure and therapy. If it does not, you may, unfortunately, require another procedure. The main focus of our Physical Therapy at Purposed Physical Therapy after having a non-conservative procedure is to maintain the range of motion gained during the procedure. Gaining full range of motion is the ultimate goal. Strength in the early stages is not as important so, typical strengthening exercises will not begin for four to six weeks after the procedure. Simple isometric exercises may be used in the early stages to maintain muscle tone, but advanced exercises with weights or Theraband will not be focused on in the early stage of rehabilitation. Advanced proprioception exercises, however, as described under conservative treatment, are important very early on in your rehabilitation so will begin immediately, and will continually be focused on as the shoulder improves. Overall you may require Physical Therapy for up to two to three months after undergoing one of the above procedures. Our overall goal at Purposed Physical Therapy is to help you regain full shoulder motion, strength, and function. If you are not improving as we would expect, or your pain is not well controlled during your rehabilitation, we will ask you to return to your surgeon for follow-up to ensure there are no complicating factors impeding your recovery. When you are well under way, regular visits to our clinic will end. Your therapist will continue to be a resource, but you will be in charge of doing your exercises as part of an ongoing home program.